Now I know I’m a newbie to this whole facebook lark but this mummy is as far as I’m concerned doing it just right. 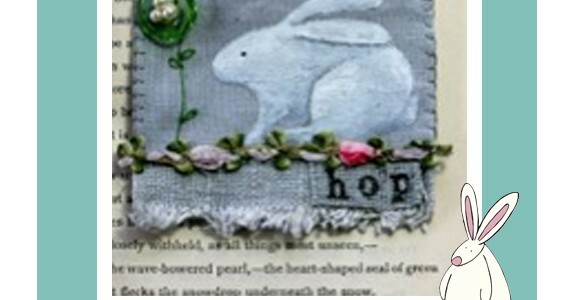 Little Burrow Designs is filling the cyber highways with vintage charms of her own loveliness, daily posts from her small holding, (wait till you see the newborn lambs) and links to other interesting craft makers. Joyful! I’ve shown her rabbit designs as it’s bunny appreciation week but she has lots of other non bunny pieces which are all lovely. If you like unique, handmade, interesting, vintage and genuine,then I promise you won’t be disappointed. And you really should click on her page for no other reason than she has eight, yes eight dogs. Seriously, and there was me waiting until my youngest turns 5 before getting one! P.s Just had an update on all Little Burrows’ pet responsibilities and as well as the 8 dogs which includestwo rescues – a Chihuahua and a Chorkie, two are collie cross with some kind of terrier, 3 are Shih Tzu’s, and one is a 15 year old farm Collie that was foster from the RSPCA, because they deemed him un-homeable due to never having lived in a house, and now always runs around freely on the farm! They also have 6 cats too, 2 rabbits (soon to be 4, as they are giving another 2 a home who are no longer wanted), 3 guinea pigs, 2 red wing parakeets, 2 tortoises, 4 North Ronaldsay sheep, 2 lambs, 2 Kune Kune pigs, 2 Embden Geese, 2 Hawaiian Ne Ne geese, 2 call ducks, four chickens, and 4 Llamas but can you believe it, no goldfish, I say there is definitely room for more in her life!!!! P.p.s Another update, she does have goldfish, approx 200 not including the koi carp bred by her husband. This lady is a legend. Follow follow follow!